Why Do Apps Keep Asking for Permission to Access My Data? My father, a new smartphone owner, recently came to me with a question about it. It seems that the Weather Channel app (one of his personal favorites) has updated, and it’s now asking him for permission to access his phone’s camera. He wanted to know why a weather app would want to use his camera – and why many of his other apps seem to want such wide access too. As it turns out, the Weather Channel had just added a new social feature where you can share your own photos of the weather. There was no cause for alarm. Still, many of the other requests really were seeking highly personal information. Some, like Twitter, want to be able to track your location by GPS to serve you localized ads. Others, like Facebook, want to copy all the names, email addresses and phone numbers in your smartphone address book. There's good reason to deny these permissions if you see no personal benefit from allowing them. Most access requests are harmless, especially when the function is needed to make the app work property. You see more of these requests lately as a result of increased default protections against malicious apps. Apple and Google simply want you to know exactly what functions of your phone each app is using, making it as hard as possible for a malicious app to sock your phone bill with unauthorized charges. The problem is that these requests seem to be getting so common that many of us simply ignore them or otherwise brush them off. The folks at Norton Mobile Security recently conducted research into the topic of app permissions and found that 68% of us are willing to trade some of our privacy for access to a free app. Further, 36% would surrender data about their physical location, 17% would give away their friends’ contact information and 15% would give away their personal photos. These permissions, in the wrong hands, could cause you a lot of grief. So should you give apps all the permissions they seek? 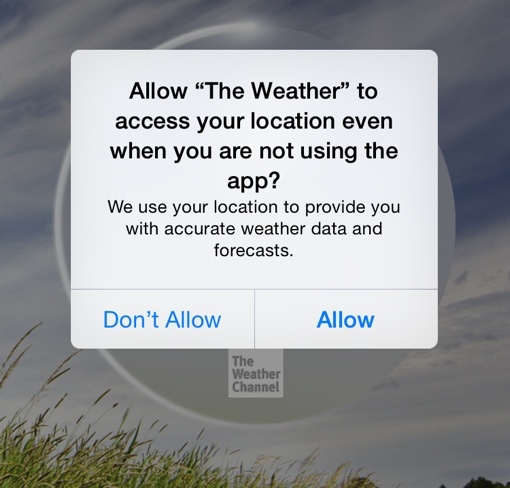 In the end, it’s up to you – this is your personal information, and only you can decide whether or not it’s worth giving the Weather Channel or Facebook or whatever app you want to use the permission to use your phone's features. Do use common sense, however. Don’t let an app you don’t trust have access to features that might wind up costing you money. You might also want to consider anti-virus protection for your phone (especially Android owners) to protect you even further against known app-based threats.